North American sales of machine vision components and systems fell 11 per cent year-over-year to $546 million in the first quarter of 2016, according to new statistics issued by AIA, the industry’s trade group. Vision companies including Basler and Cognex have also seen largely static first quarter market figures. Despite this, record attendance figures at ‘The Vision Show’ in Boston this past May suggests that interest in machine vision and imaging is at an all-time high. The machine vision components category in the AIA report decreased seven per cent to $79 million in the first quarter of 2016. Individual component categories such as cameras, lighting, optics, and software were down, while sales of imaging boards were flat. The machine vision systems category also decreased in the first quarter of 2016 to $465 million. 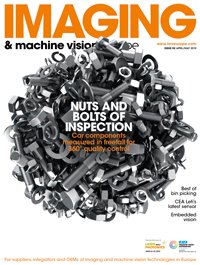 Within machine vision systems, sales of application specific machine vision (ASMV) systems decreased 13 per cent to $391 million, while smart cameras contracted by two percent to $75 million. Despite the declines on a year-over-year basis, the machine vision market in North America saw growth over year-end 2015 levels. More specifically, the components category saw an increase of five per cent in sales compared to the fourth quarter of 2015, while machine vision systems increased by two per cent.